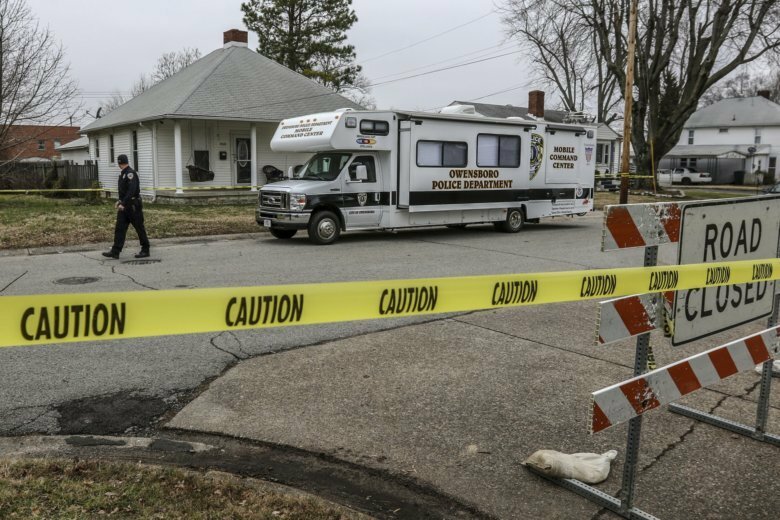 LOUISVILLE, Ky. (AP) — Two arrests were made Friday in the deaths of three people found shot a day earlier at a home in western Kentucky, and police said the investigation was “far from over” as they sought more people to question. Police in Owensboro said Arnett B. Baines, 30, and Cylar L. Shemwell, 31, both of Owensboro, each were charged with three counts of murder and one count of first-degree assault in the slayings in a residential neighborhood. A fourth victim was critically wounded. Investigators were trying to determine a motive in what was being called one of the worst shootings in the western Kentucky city in years. Police obtained multiple search warrants and want to interview more people, Owensboro police spokesman Andrew Boggess said. Owensboro is just south of the state’s border with Indiana and about 107 miles (172 kilometers) southwest of Louisville. Investigators believe at least one victim knew the two men charged, Boggess said. The three people killed were identified as Jay Michael Sowders, 43; Robert D. Smith Jr., 35; and Christopher Carie, 18. The other victim, 35-year-old Carmen R. Vanegas, was critically wounded. Police say the shootings occurred inside the home but provided few other details. Investigators were still trying to determine the relationship among the victims and how many lived at the home. Police officers called to the home Thursday found two of the victims dead and two others critically wounded. One of the wounded died later at a hospital.